Watch our review of the 2016 Knaus StarClass 560 – can this newcomer make a case for itself? Built to woo British buyers with German build quality in a stylish package, does the four-berth, fixed-bed Knaus StarClass 560 tick all the right boxes? 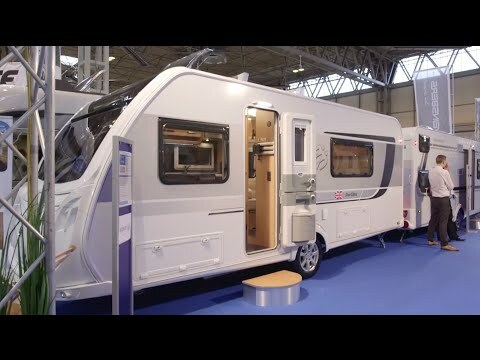 After a six-year absence from the UK market, Knaus returned nearly two years ago with a caravan offering that included the colourful Sport & Fun, the most familiar to UK buyers of the manufacturer’s tourers. There were other ranges in its line-up, but these still targeted the Continental market. At the February Caravan, Camping & Motorhome Show at Birmingham’s NEC, Knaus launched its latest offering – the StarClass. This new two-van range is aimed squarely at the UK caravanner. The StarClass isn't completely new; in fact the original range was launched for the 2006 season through the now defunct Discover Leisure dealer outlets. The stylish, heavy tourers were well made and turn up occasionally on used forecourts, although they don’t hang around for long. At launch, there are just two models in the range. Both are four-berth vans: the 565 is a twin fixed-bed, end-washroom layout, while the one under scrutiny here, the StarClass 560, has a fixed-bed, end-washroom floorplan. The StarClass rides on the excellent BPW chassis, which comes with a Winterhoff hitch stabiliser and IDC stability control system, and rolls on alloy wheels. The heavy-duty corner steadies are easily accessed and the entrance door is on the UK nearside. The grab handles aren't very large, but they are sturdy and feel very firm. The one-piece sidewalls are smooth-finished aluminium, with front and rear access lockers on the nearside, plus a Truma awning warmer, as well as external mains and TV aerial sockets. All service points are on the offside. The aluminium back panel meets a lower moulded panel for the road lights. The front is made up from two moulded sections: one incorporates the good-sized gas locker and the second takes in the triple front windows and a sunroof although, surprisingly, Knaus hasn't made it an opening unit. The roof has a Heki rooflight over the lounge area. The overall fit and finish is excellent, but at this price we would expect a TV aerial and a barbecue point, too. However, we were reviewing a pre-production model and we've been told there will be a gas barbecue point on production vans. The front lounge is a bright and airy place to be, with a big sunroof, a Heki rooflight, large side windows and the triple windows at the front – all but the sunroof open. The central chest of drawers (wraparound seating is optional) has a coffee-table extension top and separate parallel sofas, which have firm seating and come with armrests, but no scatter cushions. Lift the seat bases to access the storage space below. Two blown-air heater outlets supply the space with warmth, and there is a power point here. Artificial lighting is courtesy of four LED corner spotlights and integral roof locker lighting, while a Pioneer-branded, quality radio/CD is hidden away in a side locker. A free-standing table is supplied for main meals, at which four would be able to dine comfortably. With a separate oven and grill, a dual-fuel four-burner hob, a microwave oven and fridge/freezer, there’s no shortage of kit in the kitchen of the Knaus StarClass 560. Storage is very good, too – the tall, gloss-black fridge/freezer is located opposite, freeing up space for a cupboard and a large drawer. The glossy black worktop looks classy and is fitted with a stainless-steel sink and drainer with a glass lid (ours was missing) to enhance the worktop space. Overhead are two lockers and the microwave which, unfortunately, is located above the cooker. Under-locker LED lighting illuminates the preparation space. Our only real quibble is that the worktop space is good enough, but some cooks might feel it would benefit from having an extension flap. But, overall, it's a practical design with a good spec. The end washroom is one of the things that gives the Knaus StarClass 560 UK market appeal. However, it’s quite narrow – an extra inch or so would have made a big difference. That aside, the washroom isn't bad and we're pleased it has an opaque side window, but with no roof vent, natural light is restricted. There's a Thetford cassette toilet and a lined shower cubicle with folding doors. The shower is pretty decent, but it's not as large as some cubicles we've seen. The basin sits within a smart, glossy, black worktop and lighting is via LED units, one being in the shower cubicle. The fixed double bed is a good size (2.03m x 1.36m) and full width at the foot end: it should offer ample comfort for two people. There are two reading spotlights, plus a shelf above for books and spectacles. Lift the base to access the large storage space below; this is also where the table is stored. The front lounge easily makes up into a double bed by the usual method of pulling slats out from the centre chest and rearranging the cushions – it measures 1.98m x 1.45m. The Knaus StarClass 560 might be a four-berth van but, generally, a fixed-bed, end-washroom layout is favoured by touring couples. However, we're pleased to report that even for a family of four, the storage isn't bad. The lounge is restricted by the panoramic sunroof to just two overhead lockers, but has under-seat storage and the central chest of drawers. The kitchen excels with its super cupboard storage and massive cutlery drawer. Only two overhead lockers are fitted, but they have a small shelf beneath. The bedroom has acres of storage: the wardrobe has full-height hanging space, and above the bed are five roof lockers. Next to the wardrobe is a vanity unit, with a large mirror (one of two in the main living space), three cupboards and shelving, plus the under-bed storage space can be accessed from outside the van. The washroom has a large, mirrored cabinet, plus cupboard storage beneath the basin. With a 1440kg MiRO, the Knaus StarClass 560 is no lightweight, but this sturdy tourer is built to last: the fit and finish are excellent. The exterior looks modern and we liked the Swift-influenced front end. The rear, however, could have been enhanced further with a fully moulded back panel. At this price we would like to have seen a TV aerial, and perhaps Alde heating, too, although the Fast Warm Up Truma central heating is superb. We're also fans of the fixed double bed and the easy-to-make-up front bed, with a high-quality slat system. Storage, too, can't be knocked. It will be interesting to see how British caravanners react to this. Overall, it's a good and very high-quality tourer, one that is built to last, but with its 1600kg MTPLM and £25,695 price tag, it could have its work cut out.